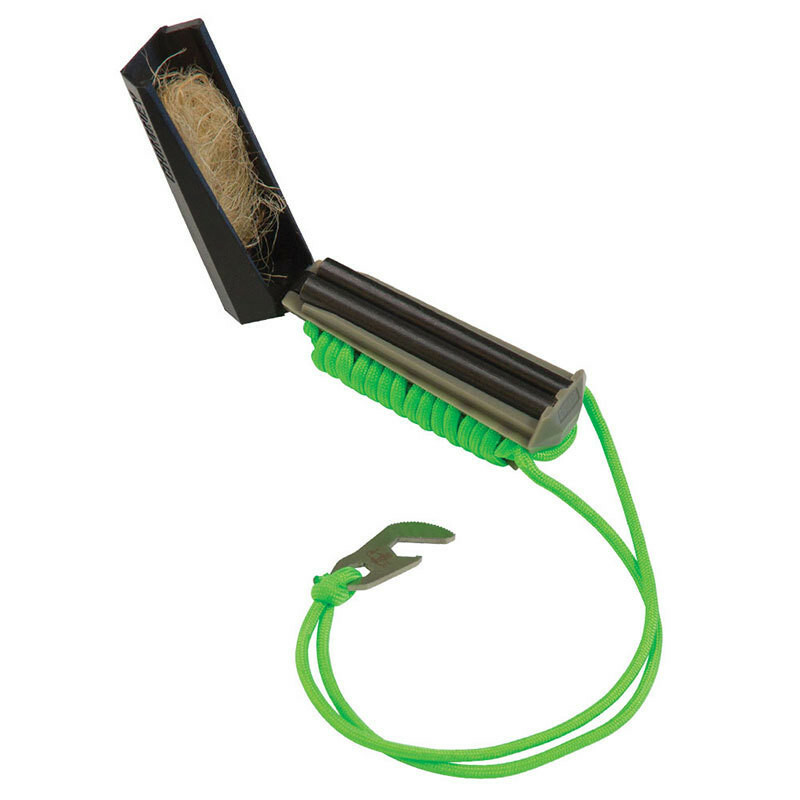 Chums' Chimney fire starter makes it easy to light your camp stove or fire with a double barrel firestone for more spark; plus it folds closed to keep tinder dry and the striker doubles as a bottle opener. Do not use cord or fire starter in a manner in which failure could result in damage to property, bodily injury or death. While this tool will aid in a survival situation, it is not a substitute for proper survival training. Tinder: Use included hemp tinder or collect dry grass, wood shavings, pocket lint, or any other flammable material. The core strands of the paracord will also work. Make sure the tinder is very dry. Make a small pile of tinder with a small depression in the middle to catch the sparks. Making the spark: Hold the Chimney by the handle in one hand. Hold the striker in the other hand. Place the striker (serrated edge down) against the firestones. Firmly scrape the striker down the length of the firestones. During first use, you will need to strike several times to remove protective black coating. Lighting the tinder: Strike the firestone, directing the sparks into the tinder. Repeat until the tinder lights. Once the tinder lights, blow lightly on the tinder to get a larger flame. Push the tinder: Using the striker, push the tinder from the lid into your pile of kindling. DO NOT LEAVE BURNING TINDER IN LID.